The next two posts are actually both going to be on testing or quizzing, but in slightly different ways. 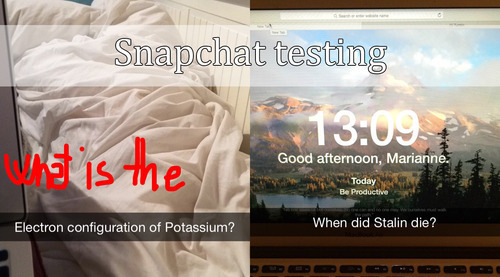 So I was thinking that we should start with the funnest and least conventional way: Snapchat testing. Almost everyone uses snapchat these days, and I am here to tell you that it can actually be pretty useful. Especially if you have a friend, or more, that are studying for the same test as you and that are in your class. If this is the case, then this might just be the thing for you. It is actually very simple. You just snap a picture (or selfie, if you want) with a question on it, and the the person you snap chatted just responds with a snap with the answer. Alternately you can decide ahead on a topic or type of question, and then just send each other prompts. For example if you decide on dates, you could just send “Stalin’s death”, and the the person could reply with the correct date (5th of March 1953). As much as you can set up “study sessions” for using this method, it gets even more fun when you just randomly receive these kind of snaps throughout the day and then just have to stop in your tracks for a moment to think about what the answer actually was. So that was the nice, little and even maybe fun study tip of the day. Please tell me how you get on with it!